Arbaeen is a national holiday in Iran and one of the biggest festivals celebrated there. It commemorates the martyrdom of Husayn ibn Ali, the grandson of the Islamic prophet Muhammad. It is observed on Safar 20 or 21, the 40th day after Ashura, the martyrdom anniversary of Imam Hussein in 680 AD. Arbaeen is one of the most significant ceremonies in the Shi'ite Muslim calendar. Arbaeen, means forty in Arabic and as per Muslim traditions forty days is the traditional length of mourning after the death of a family member or loved one. Imam Hussein, the third Imam of Shia, and his companions were killed and beheaded by the army of Yazid I on 10 October 680 AD. Ever since then Arbaeen Pilgrimage is held in Karbala, Iraq. This Ziyarah (pilgrimage) is organized at the end of the 40-day mourning period following Ashura which is the religious ritual for the commemoration of the martyrdom of Husayn ibn Ali. The pilgrims travel on foot from places as far as Basra which is about 500 kilometers (310 mi) away by road. Around 20 million pilgrims gather in Karbala on Arbaeen, and it is the world’s largest annual human gathering. Many of the pilgrims even travel barefoot from across Iraq and more than 50 countries. 2018 Dates- Arbaeen will start from the evening of 30th October and end on the evening of 31st October in 2018. Jabir ibn Abd Allah was the first ever pilgrim of Husayn ibn Ali in the Arba'een of 61 AH. According to historical books, the tradition of performing the pilgrimage on foot was elapsed during a time period after Morteza Ansari and was again practiced by Mirza Husain Noori Tabarsi in an Eid al-Adha. He repeated this action every year until 1319 AH. Some other scholars and Marja's kept following the same traditions of Arba'een up to the Saddam's time. But during the Saddam’s era the pilgrimage was banned yet some followers used to perform it secretly. It was brought to practice again just after Saddam was overthrown in 2003. 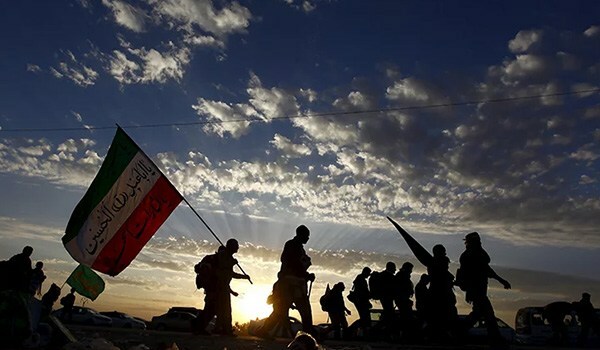 Shia cities, towns and villages all over Iraq vacate during the 20-day period of the pilgrimage as people of these areas take the roads in a massively organized and well protected mass movement, one of its kind across the globe. By 2014, over 19 million people from 40 different countries of the world participated in this pilgrimage movement. It became the second largest gathering in the world. By 2016 as per the al-Khoei Foundation, almost 22 million pilgrims gathered in Iraq. During the pilgrimage abundant supplies of food, small clinics and even dentists are available for pilgrims and they all provide these services for free. The service of pilgrims is regarded as a religious duty. The permanent brick buildings and temporary tents along the three main routes leading to Kerbala are decorated and painted. These buildings are used for praying, eating and sleeping.